Our exciting trip was not completed yet. After exploring the sheer majesty of Kumbhalgarh, we reached our second destination for the day, Ranakpur, in the heart of Aravali valleys, passing by the lush green valleys and streams. 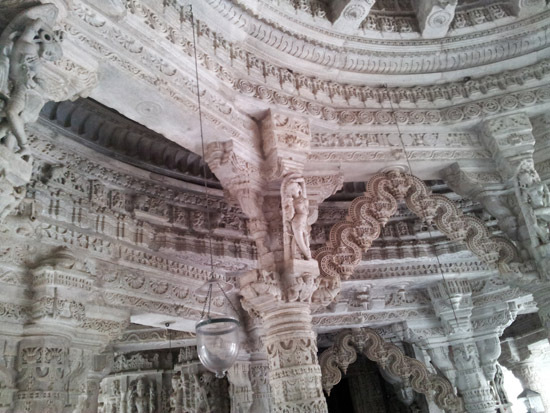 The World renowned state of the Jain art temples, it is one of the most important pilgrim among the five pilgrims of the Jainism. 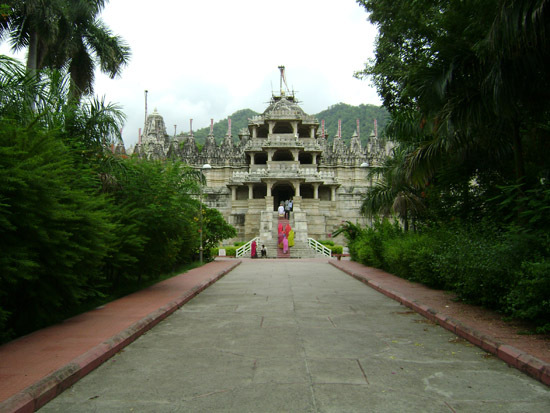 It is located between Jodhpur and Udaipur, in a valley on the western side of the Aravali Range. 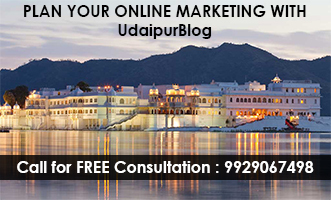 It is easily accessed by road from Udaipur. The place features a widely acclaimed main temple, dedicated to Adinatha (Lord Rishabha), the first Tirthankar (enlightened human), built in graceful white marble, designed as ‘chaumukha’ or a four faced temple and also for a much older Sun Temple which lies opposite the former. 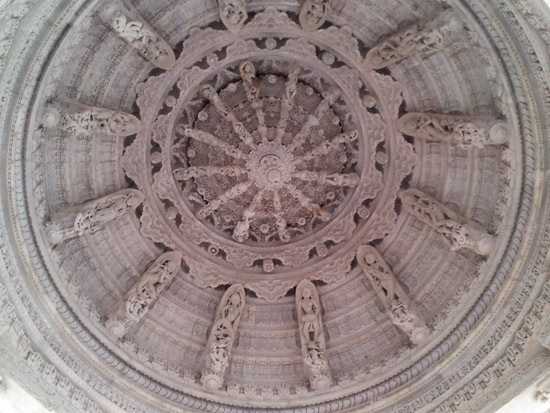 There were three distinctive domes in the main temple. 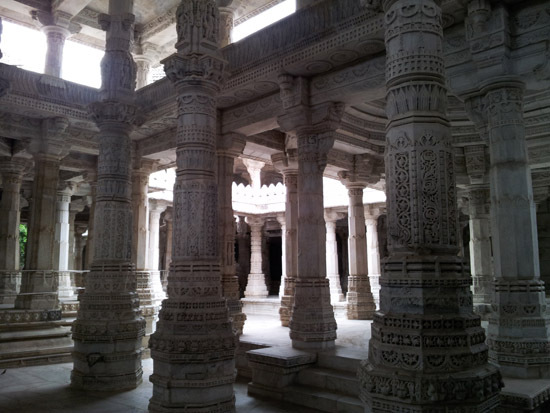 The most dazzling highlight were the 1444 intricately carved marble pillars, which support the halls and domes of the temple, which gave a spectacular effect. 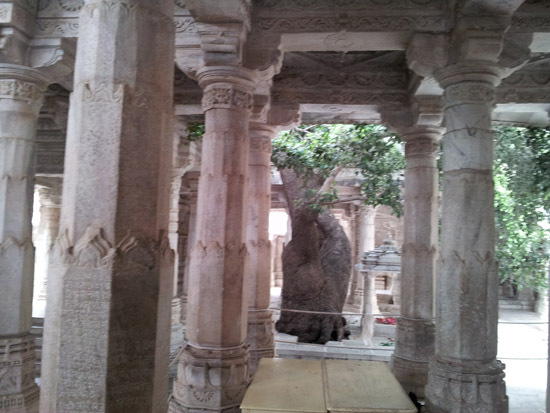 A centuries old growing tree in the huge marble structure was witnessing the sanctity of the place. In the assembly hall, there were two big bells weighing 108 kg, whose sound echoes in the entire complex. The artistically carved nymphs playing the flute in various dance postures at a height of 45 feet were an engrossing sight. As per the history, it was a businessman Dhanna Shah, inspired by a dream of a celestial vehicle, who commissioned it under the organization and got great financial support during the reign of the gifted and liberal ruler of Mewar, Rana Khumbha, in the 15th century. 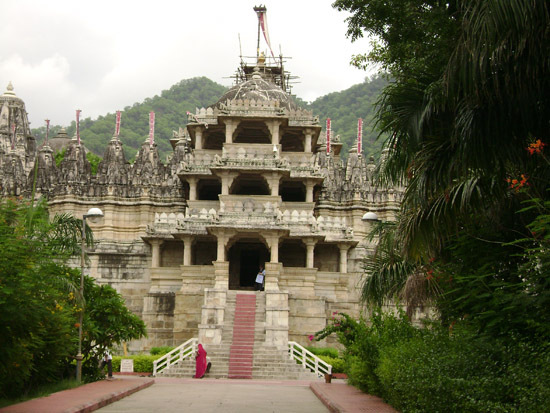 The best time to visit Ranakpur is between September and March. 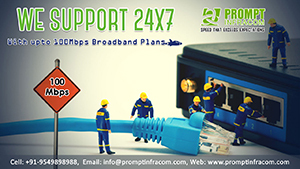 Temperature during summers varies from 22 to 42 and 10 to 20 in winters. 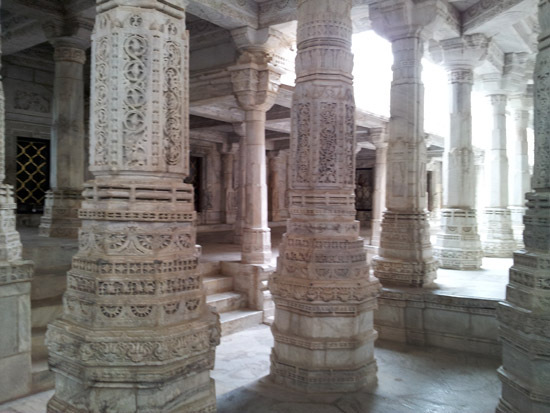 Ranakpur is the perfect place for experiencing the charm and vibrancy of Jainism in Rajasthan. It offers a peaceful spiritual experience to tourists. After the eventful journey, we all were fully exhausted, but the heart capturing views drove away the journey fatigue. So if you are looking for some unique experience of lifetime, I promise a lot of fun, excitement and adrenaline rush to you, after exploring this north-west corner of Udaipur.